I had already planned to go Dungeness crabbing on the Southern Oregon coast near Coos Bay when I received a request to interview the owners at TeSóAria Vineyard & Winery near Roseburg. No problem. A visit to the Umpqua Valley winery would be the perfect end to an adventure at sea. After a surprisingly successful time with a cooler full of fresh Dungeness crab and boat in tow, I arrived to meet John and Joy Olson. Their newly built tasting room had a high-ceiling agri-industrial feel. It was set beautifully in their vineyards, not far from the Umpqua River and within view of their home. John, to my delight, was an approachable winemaker and enthusiastic tasting room diplomat. His wife, Joy, smiled a lot and added color to his multitude of stories. This winery, as is true for most in Southern Oregon, started as a family affair and spread into the community … fast. Yet this was no “typical farm family.” My research on their website revealed that Johnny, their 21-year-old University of Oregon son, is classically trained in music and helps with the critical work of vineyard management. He sings classical arias to his family’s growing grapes. The Olsons believe happy vines produce great fruit. The vineyard property sign reads TeSóAria Wine & Vineyard with a music clef in the place of the ampersand … and so I wondered, “Is this family making music or wine?” Clearly, they’re doing both. 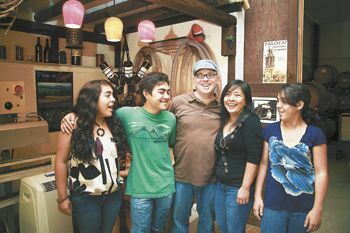 Four years ago, the family of five decided to take a big chance and leave behind John’s lucrative sales and marketing job in Southern California for a new life in Roseburg. “We left an ocean-side house with a gorgeous view on a world-renowned surfing beach near San Clemente, Calif.,” John reminisced. Surfing, scuba diving, wine and music were John’s hobbies. 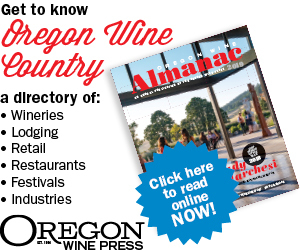 “We wanted a change of scene, and it was a bit of a trend to buy a winery in Oregon. So we did.” They never looked back. If you think music is a gimmicky add-on to their wine venture, don’t be fooled by appearances. The new TeSóAria Winery won 26 awards throughout the Northwest at wine competitions in 2011 alone. So I was curious to discover their secrets. In the tasting room, guitars hang adjacent to the wall of ribbons and medals from wine festival awards. Wine club members’ release parties offer food, wine and live music, led both by son Johnny on guitar and 18-year-old sister Rebekah sharing in the vocals. John admits he gets caught up in the spirit, plugs in his bass guitar and plays along. Music is essential to the family every day, but one can’t attribute the Olsons’ success to the winery’s music-loving vibe. It takes know-how, a trained palate, experience, etc., to make award-winning wine. John attributes TeSóAria’s success to great friends and fruit. Even John’s grapegrower friends whom he considers “some of the best in the state of Oregon”— like John Pratt and Shari Eaton of Celestina Vineyard, and Charlie Becker of Becker Vineyard & Winery — taught him the importance and techniques of growing great fruit. The name, TeSóAria, encompasses the true spirit of the Olsons’ vineyard and winery: Terra (good soil), Sol (good sun), and Aria (fresh air and good music). Three words in one describe the commitment of this winery from the beginning. In 2008, the Olsons bought Palotai Vineyard & Winery from Gabor Palotai. It had a seven-year history of producing 500 cases of quality European wines a year. John and Joy kicked it up a notch, and today, they produce 5,000 cases of Bordeaux, Burgundy, and Rhone-style wines. “I love to produce robust varietals that get one’s attention,” John said. TeSóAria’s Syrah 2010 was awarded Best of Show at the 2012 Oregon Wine, Food & Brew Festival in Salem. It’s a young wine yet tastes so mature and full-bodied — with cherry, earthy, leathery and peppery notes — that it left me longing for a good Porterhouse steak to complement this superior Syrah, which will continue to improve for years. John drove from Portland to meet me at the winery, having been at the Portland Wine & Seafood Festival where he was awarded bronze medals for his 2010 “Noir Denoir” Pinot Noir, 2010 Syrah, 2010 Bulls Blood and 2011 Vermentino. I tasted each slowly and with delight as tasting room guests began filling the place —including one couple from Olympia, Wash., who came to snowshoe the rim overlooking Crater Lake and to visit their favorite winery, TeSóAria. In departing, I filled a bag of fresh coastal Dungeness crab from my cooler as a thanks for the family’s generosity. From just this short visit, the winery endeared my heart, and now, the Olsons feel like longtime friends. It’s no surprise a friendship has been kindled with Southern Oregon’s indigenous cuisine and wine. In fact, my wife and I will return for more great wine, good music and fabulous cuisine en route from future coastal adventures — TeSóAria-style.